1. In a large pot heat coconut oil and sauté onions and garlic. 2. While the onions and garlic are sautéing add in the red curry paste, ginger, chili garlic sauce, turmeric, salt, pepper and carrot chunks. Mix well and continue to sauté until garlic and onions are translucent. 3. Add in the vegetable broth and bring to a boil. Once boiling place it on medium low and let it simmer. 4. While the carrots are cooking place the coconut milk in the blender. 5. Once the carrots are soft enough to pierce with a fork (usually about 10-15 minutes) add the the entire mixture to the blender. 6. Blend on high until smooth and creamy. Squeeze of lime once you’re ready to dig in! Top with a dollop of coconut yogurt or coconut flavored yogurt. My favorite to use in all my curry dishes is Siggi’s coconut yogurt! Hands down my favorite soup I have ever made. No lie, it is amazing. 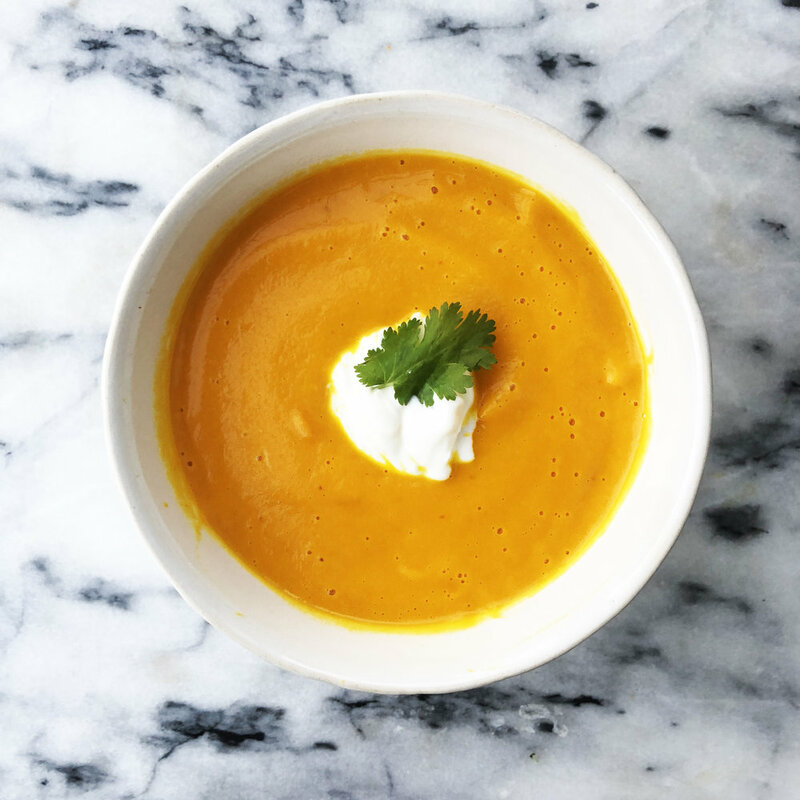 The coconut milk makes it so creamy and helps keep you full, while the curry gives you the perfect amount of warmth all mixed in with non-starchy carrots. Not only is this recipe my favorite, but it’s also so simple to make with barely any prep work. This is for sure my go to soup in the winter. Let me know what you think and if you love it just as much as I do!